Making the world a better place to live and connecting the next generation to the future. 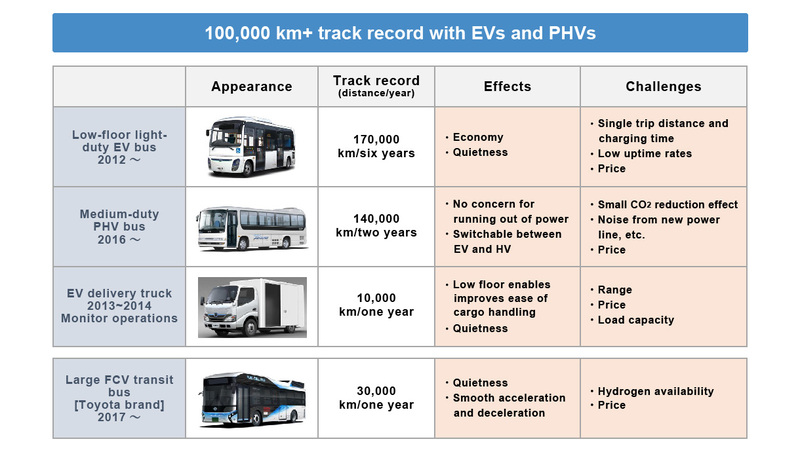 Up to this point, Hino Motors has established environmentally friendly product technology by releasing world-first hybrid vehicles onto the market and developing industry-leading engine technology. *1 Stoichiometric combustion refers to engine combustion that achieves an ideal mixture ratio in which air and fuel are completely burned, in theory. *2 A key component in fuel cells which produces electricity from hydrogen and oxygen. *3 An inverter is a device required for operating a motor by changing its rotation speed. 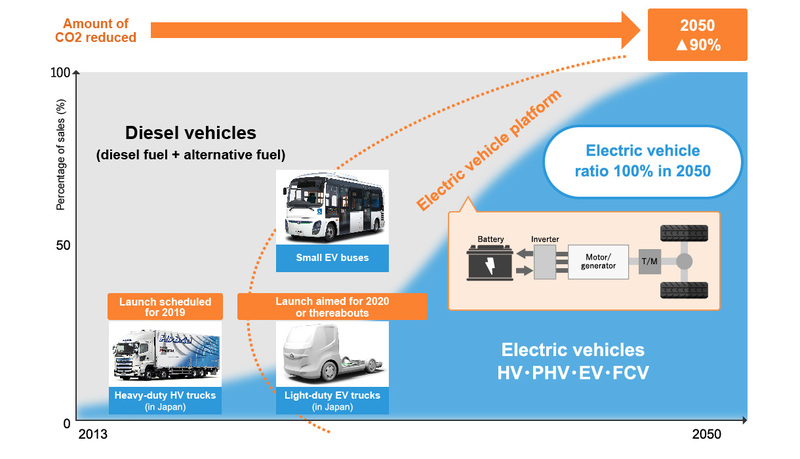 Hino has also worked toward practical applications for EV, PHV, and FCV vehicles centered on hybrid technology, establishing the technologies necessary for vehicle creation. *1 The common rail system stores fuel at high pressure from a supply pump inside an accumulator, injecting an appropriate quantity from the injector to each cylinder at the ideal timing under ECU control. *2 The injector is a computer-controlled electronic fuel injection equipment. 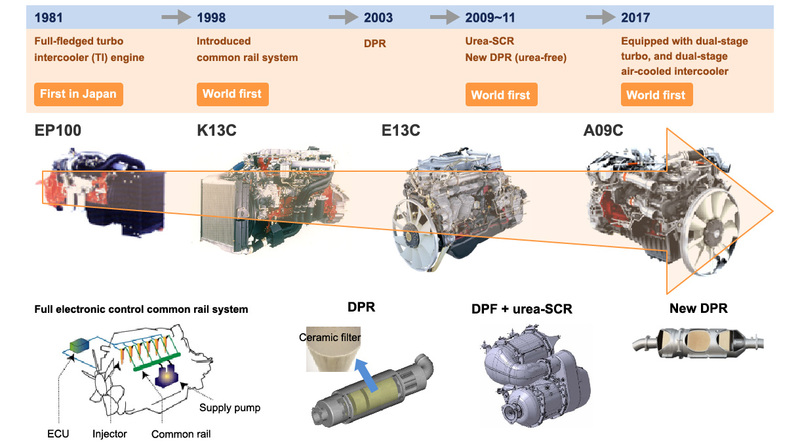 *3 The common rail system is a fuel injection equipment that injects high-pressure fuel into a container called a rail, regulating the injection pressure regardless of engine rotation speed or load. *4 diesel particulate filter (DPF) is a post-processing technology that collects particulate matter (PM) emitted by diesel vehicles, preventing this matter from being discharged into the atmosphere. *5 Selective catalytic reduction (SCR) is an exhaust gas cleaning system for reducing nitrogen oxides (NOx) using ammonia. *6 Diesel particulate filter (DPF) is an exhaust gas cleaning device. 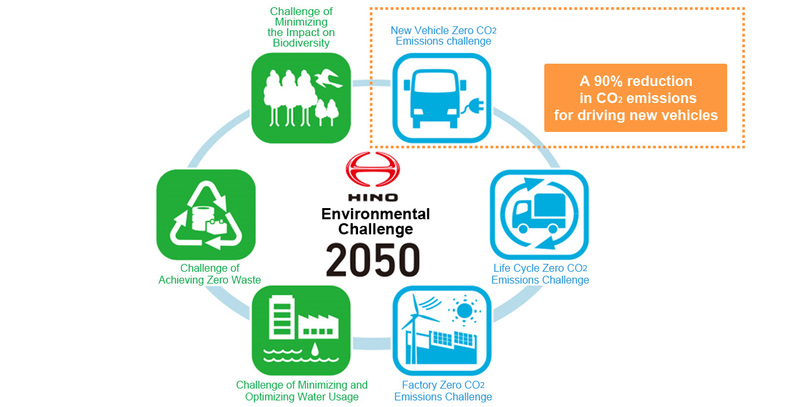 Hino Motors has formulated the "Hino Environmental Challenge 2050" to make the world a better place to live and connect the next generation to the future. To achieve the goal of "Keeping the increase in global average temperature to below 2°C,” as stated at the UN Climate Change Conference Paris 2015 (COP 21), and as a measure against global warming, the Government of Japan aims to achieve its targets by setting the CO₂ reduction target to 26% in 2030 → 80% in 2050, making renewable energy mainstream and popularizing electric vehicles. Hino Motors is committed to three approaches to reducing CO₂ emissions. Parallel with our technological development, we aim to achieve CO₂ reduction targets by working to strengthen social infrastructure through collaboration with stakeholder organizations. We aim to improve technology for all vehicle models, expanding the functions and systems required for next-generation vehicles by 2030.